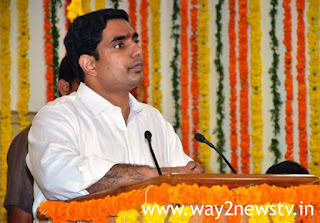 Nara Lokesh, a minister in foreign land, met with the representatives of the company. He said they aimed to provide better service to people with technology connectivity. After the formation of a new state we are working on the goals. Andhra Pradesh is one of the top three states in the country by 2022, 2029 is the number one in the country and 2050 to work with the aim of the competition. We aim to achieve 15% growth. At present, 12 per cent growth has been achieved. The rest of the three percent growth will be made available to everybody through the Internet. WiFi, Television and Telephon are available for Rs. Internet access is provided to remote villages through Google Xfoscope technology. Through this development platform, all government information has been brought to the same platform and a single source of truth is being set up. Real time governance is being implemented. Sensors, drones and IOTs are constantly realizing pensions, ration, climate and land examinations in real time. There is number one on doing business doing. Kia, one of the largest car companies in the world, has come to Andhra Pradesh. The electronics manufacturing sector is rapidly developing. Companies such as Fox Con, Cell Can, Dickson and Carbon have already started operations. Aam Aadmi said that the network should be able to cooperate with Andhra Pradesh in cybercrime and to work efficiently.According to the company's representatives, the fiber grid network will be actively involved in cyber security and cooperation with Andhra Pradesh. We will share with IIDD. The Center for Excellence for Cyber ​​Security will be set up in Andhra Pradesh.